With more hope than sense, Germany had more than 1,900 Type XXI and Type XXIII submarines under construction or on order on the last day of the European war. The whole point about the XXI was that it was invisible to radar. The 10 cm radar sets available in 1943 had a very hard time picking up the large ball valve snorkel head of the XXI. The smaller T-valve heads which were in development could not be seen by 1943 radar and were very hard to find with 1945 radar. The XXI was virtually invisible on the march. 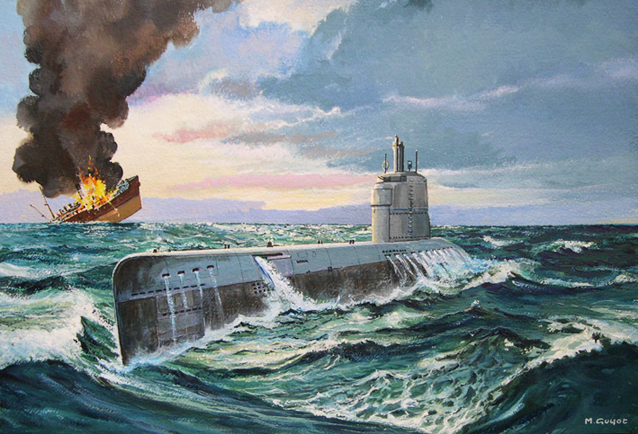 The 300 U-boat scenario could not have won the war. It was simply not feasible at the time when it could have won the Battle of the Atlantic (before 1941) and it was inadequate to win once it was feasible (1941). If you look at the constraints put on U-boat production in the 1930s, there is no way to get to 300 U-boats in 1939 or 1940. Under the treaty of Versailles, Germany was not allowed any submarines, so the Germans did some U-boat design work for other countries during the 1920s and early 1930s to keep up with the state of the art. Hitler was afraid of various treaty obligations, so he waited until 1935 to build his first small U-boats which were almost assembled from kits. The first Type II was launched is June 1935 and 13 more followed until the end of the year. Production peaked in 1936 with 10 Type II, 2 Type I and 9 Type VIIA. A single Type VIIA was launched in 1937. The U-boat building program was initially hampered by the British-German naval treaty which in 1937 allowed Germany 31,500 standard tonnes of U-boats. The standard tonne was related to the actual displacement. The Type II had 250 standard tonnes, the Type VII was 500, the later Type IX was 740 and the Type I was 712, which gives a total U-boat fleet of 12,424 standard tonnes in mid 1937. In addition, there were 8 Type IX A and 11 Type VIIB under construction or ordered totaling another 11,420 standard tonnes. The make up of the remaining 7600 tonnes were hotly disputed in mid 1937. Doenitz wanted more Type VII and the admirals wanted more long range fleet boats, the Type IX. The tonnage problem was largely solved when further negotiation with Britain at the end of 1938 increased the German tonnage to 70,000 standard tons, although this was to be done in stages over several years. This meant that Germany would be limited to a fleet of about 120 - 150 U-boats, depending on type mix, on reaching the final stage some time around 1943. Plan Z called for 174 U-boats at the end of 1943, which was already over the limit. On September 1, 1939, Germany had 57 U-boats in operation: 2 Type I, 30 Type II, 10 VII A, 8 VII B and 7 IX which totaled 23,100 standard tons. This was well below the 1937 allowed maximum and can be taken as a clear sign that Hitler was not expecting a war with Britain in 1939. Germany produced 7 more U-boats in 1939 and 54 in 1940, with losses of 35 during that period. If the Germans had used every loophole in the naval treaty with Britain and stretched things to the breaking point, they may have had around 90 U-boats in September 1939 and maybe as many as 150 by end 1940. This would have been most unpleasant for the British, but it would not have been decisive. In order to get the required 300 U-boats by end 1940, the shipyards would have had to set the stage for flat out production already in 1937/38 at a time the tonnage extension was not yet negotiated. Hitler would only have authorized this clear breach of the treaty if he had known he would have to fight the British when he attacked Poland. If he had known that, I am not at all sure he would have invaded Poland in 1939. If you turn this around and assume the Germans more or less stick to the naval treaty through 1939, bend the rules in 1940 and cheat in 1941, then they get to the 300 U-boats some time in the second half of 1941. Note this was not in Plan Z. Starting the war in Sept./Oct. 1941 has all sorts of advantages, but lets stick to U-boats. If we look at potential British naval rearmament scenarios we already have a problem because the invasion of rest Czechoslovakia historically started serious British rearmament. In order to keep the British quiet, this March 1939 invasion would have to be postponed, say to spring 1941 or even to coincide with the invasion of Poland. In our scenario, British intelligence will probably pick up a violation of the treaty some time in 1941 at the latest. Note the Germans are already technically in violation of the treaty timetable in 1940. Thus the British are probably making adjustments to their ASW investments by spring/summer 1941. Also note they have developed the cavity magnetron by now. The shipping losses in the first 6 months of this scenario would be dramatic. If we scale up the historic losses to 300 U-boats, the British lose around 8 million tons of merchant shipping which was around 20% of the available western fleet (estimated at 40 million tons) in the first 6 months of the war. Note the total loss would be higher since we are not considering losses due to surface ships, airplanes and other Axis countries. Historically a force of 20 - 25 ocean going U-boats sank around 800,000 tons from Sept 1939 through Feb. 1940. In our scenario the ocean going fleet would be about 10 times bigger. One can argue that the sinking efficiency of such a large U-boat fleet would be less than for a fleet of 20 - 25 U-boats, but even so, the losses would be dramatic. Also, if we apply the same U-boat loss rate per million tons sunk, then we get to around 100 U-boats lost between Sept. 1941 and Feb. 1942, hardly a cheap victory. Historically, the best U-boat statistics were achieved in the spring and summer of 1940 when the loss rate was less than 5 U-boats per million tons sunk and the efficiency was averaging around 10,000 tons sunk per U-boat per month. This was the time the U-boats had their act together, but the British did not. By 1941 the efficiency was below 2,000 tons/month and the U-boat losses were back to 1939 levels. Under the postulated conditions, the British get their ASW act together rather faster than they did in 1940 so German losses start increasing instead of decreasing. On the other hand, German production would be over 200 U-boats per year, compared to only 54 in 1940. Let us assume the shipping loss rate continues on as in the first 6 months and the U-boat losses increase slightly. The end result is another 8 million tons sunk and say 120 U-boats lost from March - August 1942, so the size of the U-boat fleet is barely keeping even. This would be the optimistic version. It is also quiet possible that the efficiency goes down in the second 6 months. In any event, it is unlikely that more than 15 million tons are sunk in the first year with a loss of around 200 - 250 U-boats. Historically almost 19 million tons were lost to end 1942 due to all causes. Obviously the loss of say 12 - 15 million tons of merchant shipping in the first year will have a much bigger effect than losing 19 million tons over 3 1/3 years. It may have been enough to throw Britain out of the war or it may not have been. Once we reach the fall of 1942, the U-boat are in a very similar position as they were historically. At that time efficiency was around 2,000 tons/month and losses were around 20 U-boats per million tons, a no win situation, and the situation could only get worse. The bottom line on the 300 U-boats is that they could realistically have been available at the beginning of the war assuming the war starts in Sept./Oct. 1941. These 300 U-boats would have caused massive losses in the first year, at massive cost to themselves, and then found themselves in a losing scenario because of technical deficiencies. It is possible, but not likely that they decide the war in that first year. Now assume the XXI project is two years ahead of itself. This is not a simple premise since the 1943 XXI would not be the same as the 1945 XXI which was the product of the prevailing chaotic conditions. The workmanship would be better and the mess with the hydraulic system would probably not have happened since the 1943 XXI would still have used electric motors. It would have been a higher quality boat with a lot less problems. Further, the crew training program would have been undisturbed by enemy ASW in the Baltic. Also not that snorkel technology would have to be 2 years ahead of itself, so there was scope for a small, radar invisible T-valve snorkel down the road. What would have happened if about 100 of these 1943 XXI had been operational by the summer of 1943? They would have sunk a lot of ships and would probably have torn up the odd convoy. If we assume a production of 20 XXI/month and a loss rate of 10 - 15 per million tons sunk, we wind up being able to sink 1.3 - 2 million tons per month and still keep up the number of U-boats in the field. The loss rate of 10 - 15 per million tons is reasonable when one considers the way the XXI would operate. It would be invisible to radar since it never surfaces and the snorkel head is very hard to find, so losses while enroute to station would be minimal. It carried 23 torpedoes and had a fast reload system which would have allowed at least two attacks on a convoy before being found. So the XXI gets in something like 6 kills with 12 torpedoes before it has to dive away. With some luck, they could get off 18 torpedoes which would give around 9 kills. A single XXI attack would result in the sinking of 30,000 - 50,000 tons and the XXI probably has an even chance to get away. Note it can run for 11 hours at 10 knots, which is more than adequate for keeping up with a slow convoy. So far we are working with standard torpedoes, no Lerche. The big problem with winning the Battle of the Atlantic becomes finding the convoys. The XXI was capable of finding its own targets out to a distance of around 30 NM using sonar and it could probably hear a battle 60 or even 90 NM away. The best way to use them would have been under radio silence for the whole voyage and that would have been the end of ULTRA. However, it is doubtful that Doenitz would have done that. He would most likely have continued on with all the chit chat, although that may have tipped him off to ULTRA since a lot of XXI would have survived the attempts to sink them enroute and also they would have picked up the attempts to reroute convoys. I would think that given a year, Doenitz would have found ways to minimize the effect of both HF-DF and ULTRA. Since the XXI could have operated in a high threat area, it could have operated close to the western approaches and picked up its targets relatively easily. This does not answer the question of how many ships get sunk. In order to win the Battle of the Atlantic, the objective would have had to be 15 - 20 million tons per year, which was Allied production plus a modest reduction in the total pool. Historically, the U-boats sank 5.8 million tons in 1942, their best year, out of total Allied losses of 8.2 million tons. The XXI would have had to manage about 3 times that, rather unlikely given only the XXI. If we throw in wire guided torpedoes like Lerche, the numbers start to look better since the XXI can now bite back hard against pursuing ships. And so we find ourselves on that slippery slope of “What ifs”. The XXI by itself in 1943 would most likely not have resulted in a draw or a German win, but in a longer war. However, it was a vital ingredient in any German draw/win scenario. The other vital ingredients were an earlier appearance of jet aircraft, notably the Me 262, and the death of Hitler by 1943. With the Me262 in control of the air over the Reich in 1943, the XXI doing major damage in the Atlantic and the generals running the war without Hitler’s interference, a draw was quite possible. In this sort of scenario, the Americans would have had a tough time delivering an atomic bomb in the face of German air superiority.